As you can see by the side-laying water gallon, larger items are a tight squeeze but the shelves do move around to allow you to fit as much of a variety of items as possible. As you can also see from the location of the water bottle, one thing that these fridges do lack is a freezer component. 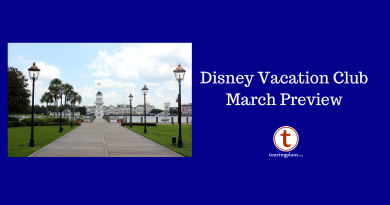 So your frozen fruit, Hot Pockets, and Mickey Premium Bars are all unwelcome in your hotel room. More seriously, this could be of concern for anyone who might rely on the freezer for medical items. Ice is, of course, available free of charge from resort ice machines. The door holds a bit more than you might expect. A half gallon of milk fits on the taller bottom shelf, as would a two-liter soda and, perhaps more importantly, a bottle of wine. The top shelf could handle soda/beer cans, juice boxes, or, for the purposes of this picture, an average sized apple. It is also important to note that the refrigerators in most rooms are located inside of some type of decorative furniture, sometimes as a stand-alone or often inside a larger dresser-type unit. Occasionally the doors to these units open in the opposite direction of the door to the fridge, which can be awkward. They are also generally located at floor level. This could be somewhat of an issue if someone has difficulty bending down. They are also at perfect level for curious toddlers or preschoolers to open. The smaller dorm sized fridges shown in this article are perfectly acceptable for storing a few necessities and maybe some leftovers. If you are the type of person who likes to bring along a lot of food or likes to always have a lot of cold drinks and beer available, it might be more beneficial to bring a cooler if driving or to pack a collapsible cooler or pick up a small one that you don’t mind leaving behind. 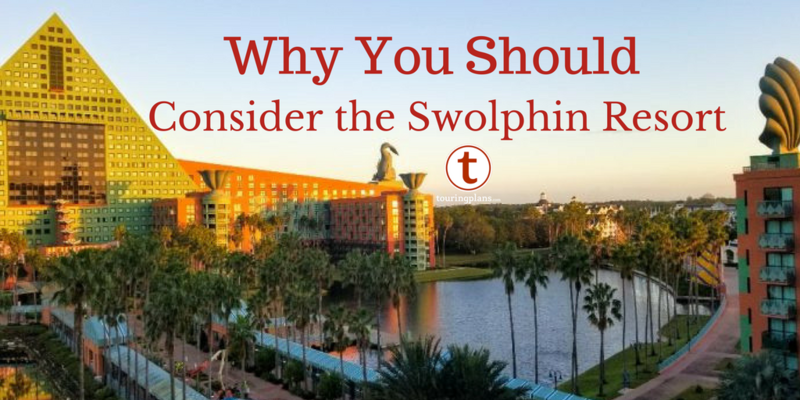 For the run-of-the-mill Walt Disney World resort guest, however, they are a perfectly useful and welcome addition to guest rooms. Wow. An entire article on room fridges. Just wow. I eagerly await articles on such topics as “how bed sheets work”, “how to turn on your bathroom faucet”, “how hair dryers work”, “how to turn on a TV” and any number of other minutia that anyone who has been breathing for more than 5 years should know. The mind boggles. 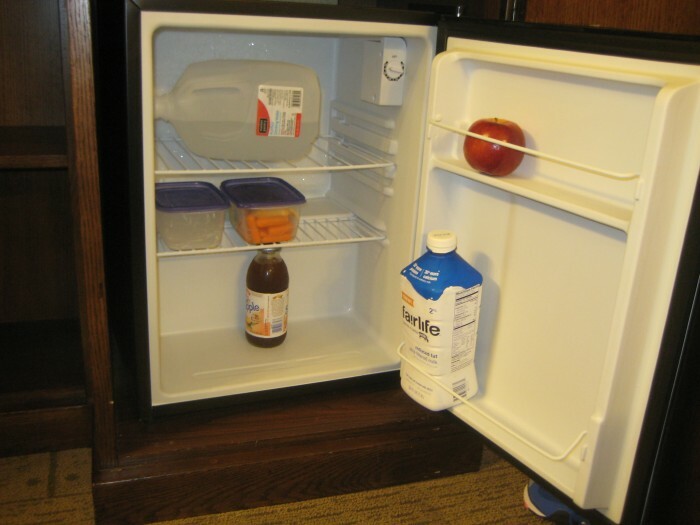 A lot of families, especially with young children, like to pack food and drinks for their room and need to know how much they can actually fit in the fridge. To say nothing of people who need to bring along baby formula or medical supplies that need to be kept refrigerated. Sometimes the minutia matters. Probably not as much as you think. Step back and think about the fact that, with all the other Disney topics you could have written about, you chose to write about the size of fridges in resorts. Anyone who’s life depends on such medical supplies probably would have already contacted the resort and found this info out in detail. It’s also hard to imagine anyone who would need to refrigerate more medical supplies than could be held in the smallest dorm fridge. Someone who needed such a large volume of medical supplies would probably not be staying where the fridge is this size. 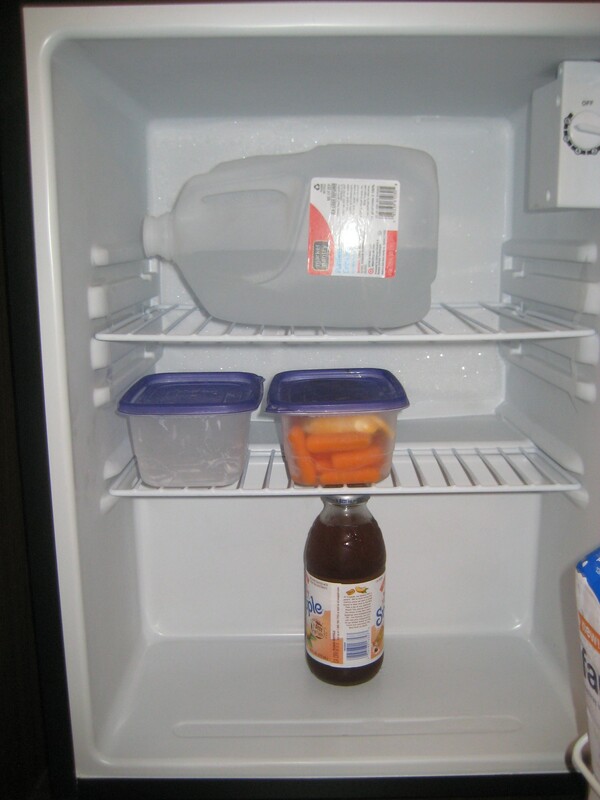 As for people who like to keep food in their rooms, they would just rotate things into the fridge more often. 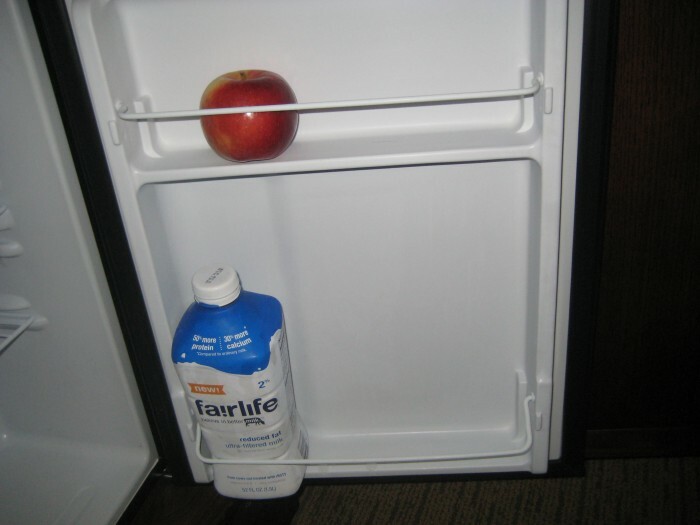 Fridge sizes vary at hotel locations all over the world from none to kitchen size. Frequent travelers know this and adapt to whatever they get. One-time travelers probably didn’t plan on having a fridge in the first place, but assuming they do, it’s again hard to imagine the need to refrigerate more than a small dorm fridge (smaller than what you show here) could hold. If someone needs to refrigerate more, they obviously wouldn’t stay where the fridge is this size. Because there are ice machines in all the resorts, there is no need to put bulky liquid containers (except for perhaps milk products) in the fridge. I actually found this really helpful! We are in fact travelling with a baby and will be bringing milk and yogurt etc. It is good to know what to expect this to fit. It’s also really good to know ahead of time that there is no freezer compartment. We will need to figure something else out since we were planning to bring ice packs to bring in to the park. If you don’t have a anything nice to say, don’t say anything at all.